Underdog against its will? We analyze the potential of the new APU AMD A-series A8-7410, called Carrizo-L. The top model in 28 nanometers promises a lot for AMD's entry-level line-up. What are the main rivals from Intel for the APU? Can the Radeon R5 also beat the Broadwell HD Graphics? Small brother? 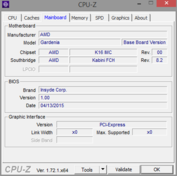 Carrizo-L is AMD's entry-level chip in the world of modern APUs. There has often been news about the big brother Carrizo over the last months. It is the sixth generation of AMD APUs (graphics chip and CPU combined). These faster mainstream APUs have a configurable TDP between 12 and 35 watts and always 4 cores besides a high Turbo clock of up to 3.4 GHz. We already introduced the APU generation "Carrizo" in our preview article. Despite the "old" 28 nanometers technology, AMD promises big improvements in a product class that is mainly defined by its power efficiency. How can we provide the same performance with less power draw? That is the decisive question for both AMD and Intel. Thanks to higher packing density and Voltage Adaptive Operation, AMD wants to reduce the consumption noticeably (40%), and Excavator cores as well as smaller improvements for the GPU are supposed to increase the performance at the same time. This article will have a closer look at Carrizo-L. We already have the first chip A8-7410 inside the Toshiba Satellite C55D-C-10P in our editorial office. The successor of the Beema platform is supposed to be a big deal in the market of inexpensive (sub-) notebooks. Similar to the predecessors, the APUs combine CPU, GPU and an AMD Secure processor including input/output systems. The maximum power consumption is between 10 and 25 watts (TDP). We can look at a quad-core chip A8-7410 clocked at up to 2.5 GHz inside the Toshiba Satellite C55D-C-10P in this article. This chip is the top model of the AMD 7000-series. It also includes a Radeon R5 GPU. The power consumption is between 12 and 25 watts depending on the load. Microsoft’s upcoming graphics interface DirectX 12, which will be available this summer with Windows 10, is supported by the APUs. We already know the graphics unit Radeon R5. It was also used for Beema notebooks (A8-6410) and provided decent performance. 128 shader units (GCN architecture with two compute units) run at up to 800 MHz. This is at least the case for our Toshiba review unit, where the TDP is probably limited to 15 watts. 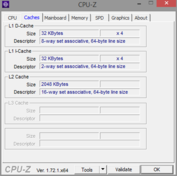 Ex-works with Catalyst 14.5. We installed 15.7 before the benchmarks. The TDP class of the AMD A8-7410 (12-25 W) puts it right up in the competition against the following CPUs/APUs. If we consider the price of the Toshiba notebook, we also have to look at Intel Core i SoCs (530 Euros/~$582). Intel’s Bay Trail-M is used in notebooks for around 400 Euros (~$439). Compared to the predecessor A8-6410, the 7410 has a 100 MHz higher Turbo Boost frequency and a 200 MHz higher nominal clock. We think the differentiation to the slower SoCs from Intel is interesting, where devices up to 400 Euros (~$439) with Bay Trail-T play an important role. The comparison with the predecessor is not overwhelming. The A8-6410 is 30% faster in Cinebench R11.5 Multi, and even the A8-6310 is 24% faster. We repeated the benchmarks, but the results were always very similar. 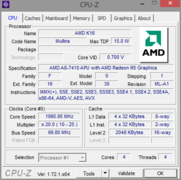 There is no disadvantage in the Single-Core test (R11.5), where the A8-7410 and the 6410 are identical. The disadvantage is not that big in the R15 Multi-Core test, but it is still 5% slower. The R15 Single score of the 7410 is once again lower than the predecessor. The cross-platform benchmark Geekbench 3 also shows a small deficit for our A8-7410 and the 6410 is up to 10% faster. The reason for the bad results is the bad Turbo utilization, probably due to the manufacturer limiting the TDP to 15 watts. 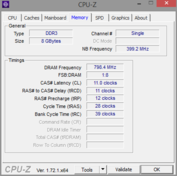 The multi-core tests are executed with 1.6 GHz and the clock will just occasionally jump to 2.4 or 2.5 GHz for one second. The higher frequency can be maintained longer at the start of each test (5 seconds), but the 1.6 GHz are already dominating after 30 seconds. The behavior of the APU is similar in the single-core tests: It starts with fluctuations between 1.6 and 2.5 GHz, but 1.6 GHz dominates after a short while (around 5 seconds) compared to 2.4 GHz (1 second). This is technically throttling, because the nominal clock of 2.2 GHz cannot be maintained. We will try to clarify with Toshiba about the imposed throttling limitations. Intel’s Core i5-5200U is between 49-79% faster in the mentioned multi-core tests. The Core i3-5005U has an advantage of 20 up to 45%. 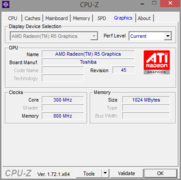 The A10-7300 is just beaten by the A8-7410 in R15 Multi, but the situation changes in the single-tests of Cinebench R15 and R11.5. This is not surprising since the Kaveri GPU has a higher performance rating. The difference is very small at 12-13%, which is once again caused by the bad Turbo utilization. The Pentium N3540 (Bay Trail-M) is 22% faster in R11.5 Multi, but the A8-7410 has an advantage of 10% in R15 Multi. All single-core tests on the other hand are won by the Carrizo-L (17 up to 31%). This continues in Geekbench 3, and the A8-7410 has an advantage between 5 (single-core) and 18% (multi-core). This should, however, be the case, because a Pentium N3510 is used for notebooks that cost around 400 Euros (~$439). The review unit with Carrizo-L is currently available for 530 Euros (~$582). The PCMarks 7 and 8 evaluate the performance of the whole system including the GPU, the hard drive as well as the memory. Laptops with SSDs would have a clear advantage, particularly in PCMark 7. Such devices are therefore not listed in the comparison graphics and are not (yet) common in the price range of the Toshiba C55D. The APU can unfortunately not provide smooth playback and the load of the four APU cores is close to 90%. There are also frequent picture errors. The use of other applications is still possible, at least if you are just browsing the web. This experience is smooth. 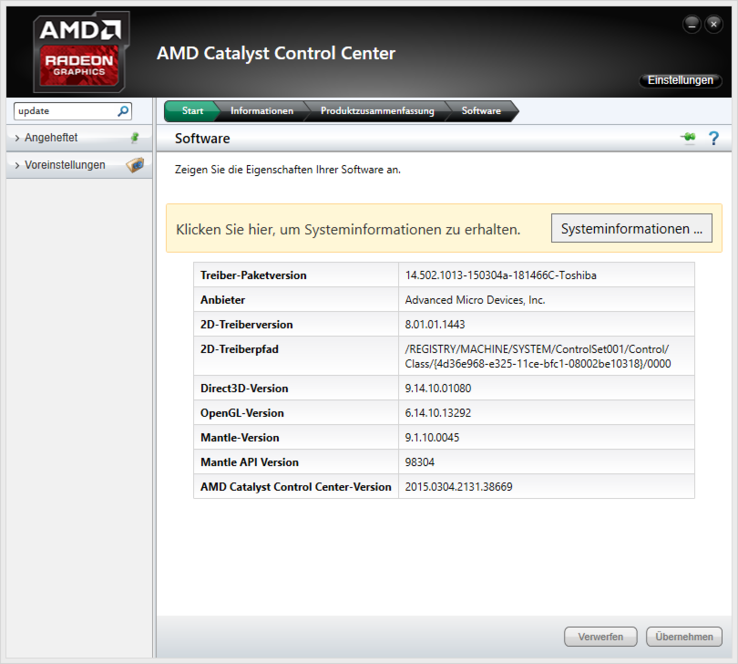 There are unfortunately no PCMark 7 results for AMD Beema in our database. PCMark 8 shows a tie as long as there is no dedicated Radeon R5 M240 (HP 355 G2). The HP 15-g005ng (A8-6410) is on par, while the HP 355 (A8-6310) is 8 up to 25% faster. A system with the Core i5-5200U and Intel HD 5500 has an advantage of 35% compared to the AMD review unit with Carrizo-L (PCMark 7), while PCMark 8 even determines 32 up to 41%. The weaker Intel SoCs like the Core i3-5005U are also still 16-48% ahead of the A8-7410 system and the integrated HD5500 does not seem to be a huge drawback. The A10-7300 is faster in combination with a Radeon R6 (Kaveri), which has an advantage between 24 and 36% depending on the benchmark. The Radeon R6 certainly gets some important points because it is one of the fastest integrated GPUs from AMD after the R7. Intel's Pentium N3540 (Bay Trail-M) is only beaten by 7% in the overall score of PCMark 7, but we have no comparison results for PCMark 8. The same applies for the Pentium N3510. Let’s start with the 3D scores of some benchmarks. Ice Storm Standard Graphics (3DMark 2013) determined pretty much the identical score compared to the A8-6410. The HP 355 G2 with the same APU is an exception with its R5 M240 and is therefore 30% faster. This result continues in the Cloud Gate Standard score and 3DMark 11 Performance GPU. It seems that the R5 of the A8-7410 does not even have a slight advantage over the R5 in the A8-6410. 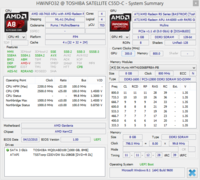 Toshiba lets the Radeon R5 run at 800 MHz. The Intel HD 5500 is 11-12% faster in 3DMark 11 Performance GPU. The same applies in 3DMark 2013, where the Intel GPU is 20 and 29% faster in Ice Storm Standard Graphics. Cloud Gate Standard Graphics even determines an advantage of 40 to 49%, respectively. However, the 3DMark scores are also influenced by the faster Intel CPU (Broadwell i5 & i3). Is the advantage of an integrated Radeon GPU gone? It certainly looks this way, since the Intel chip is also on par in Cinebench R11.5 OpenCL. The old 3DMark Vantage is also won by the Intel GPU, the Core i3 system ThinkPad Edge E550 is 35% faster. You would need at least an A10-7300 with a Radeon R6 GPU (Kaveri) to beat Intel’s "powerful" integrated GPU. The R6 is 21 up to 35% faster than the HD 5500. By the way, the GeForce 920M, Nvidia's slowest 9xxM model, is 114 (Cloud Gate Standard Graphics), 126 (R11.5 OpenCL), 128 (3DMark Vantage) or 129% (3DMark 11) faster than the Radeon R5. The HD Graphics (Bay Trail-M) is easily beaten by 50% up to 70%, so the Intel GPU of the Pentium N3540 cannot compete with the Radeon R5 (Carrizio/Beema). But it does not have to, since it has a much lower TDP of just 7.5 watts. The corresponding laptops are more frugal and manage longer runtimes. Thanks to the Radeon R5 M240, the A8-6410 in the HP 355 G2 is almost twice as fast as our integrated Radeon R5 in Dota 2. The game is only playable in the lowest settings. The Intel HD 5500 is 64 and 91%, respectively, faster. The HD Graphics (Haswell), however, falls behind the Radeon R5 (Dota 2, Tomb Raider). We can compare the frame rates with the predecessor APU A8-6410 in Tomb Raider, and the latter is around 20% faster in the low and medium presets. This has to be the result of the throttling of the APU cores by Toshiba. The Radeon R5 does not throttle in our review unit and even runs at 800 MHz in our stress test. Our A8-7410 only manages comparable values to the predecessor Radeon R5 in Battlefield 4, only the Radeon R5 M240 has a clear advantage. The GeForce 920M is 160 and 180% faster in Bioshock. The advantage is even 200% in Tomb Raider, and 66 or 68% in Battlefield Hardline. We also tried Tomb Raider with the Bay Trail Pentium, but the HD Graphics is between 40 and 70% slower than the Radeon R5 of the Carrizo-L depending on the settings. 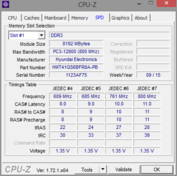 The HD Graphics from the 15-watt Broadwell SoCs is not necessarily faster than the R5. It is 30% slower in high settings, but around 40% faster in low settings. Sure, Carrizo-L is a chip for inexpensive budget notebooks, but we are still disappointed by the performance from the top model A8-7410 in the Toshiba notebook. There are barely any differences compared to the APU A8-6410 predecessor, especially since the tested Toshiba Satellite C55D-C-10P is supposed to retail for 530 Euros (~$582). The performance does not fit into the segment, and the 15-inch device does not offer any highlights in other categories like the components, ports, etc., either. Our first Carrizo-L sample does not leave a good impression. The Turbo utilization is very limited and we even noticed throttling. We are eager to see whether the next review devices with Carrizo-L will have the same issues or if the performance disadvantage is only a result of Toshiba’s decision for the TDP limit. Throttling does not limit the general usability of the laptop, but this is obviously a very unfavorable phenomenon for a performance comparison of a new platform. For now, Carrizo-L only appears to be Beema with an optional TDP limitation (Toshiba test model) and a new socket (for the compatibility with Carrizo). The gaming performance is disappointing as well, the Radeon R5 is not only usually much slower than the Broadwell HD Graphics, but the frame rates are often also lower compared to the "predecessor" Radeon R5 (Beema) of the A8-6410. AMD wants Carrizo-L to compete with Intel’s Haswell Pentium, Bay Trail-M and simple Core i3s. This will obviously only work when the prices of corresponding devices are between 350 and 450 Euros (~$385 and $494). This is the segment where you can find the mentioned Intel entry-level SoCs. 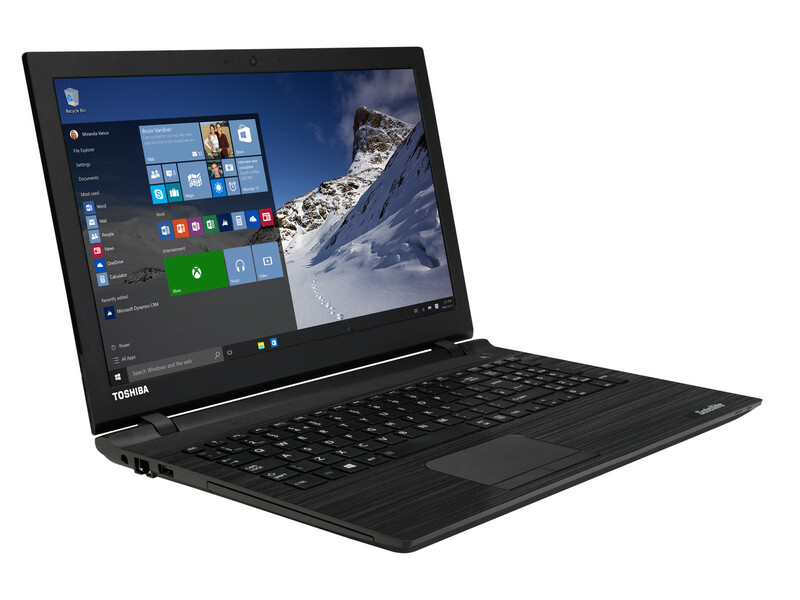 Toshiba's Satellite C55D-C-10P is definitely too expensive at 530 Euros (~$582), especially since the manufacturer does not seem to utilize the maximum performance of the Carrizo top model. This means you ultimately get a weak APU that is just a couple of percent points faster than a Bay Trail Pentium or sometimes even beaten. Haswell Pentium and Core i3 are in another league, at least in respect of the raw CPU performance. The situation is better when you look at the graphics performance of Carrizo-L, because the HD Graphics (Bay Trail-M) is easily beaten by 50 up to 70%. However, the Radeon R5 cannot beat the Haswell Pentium GPU (Dota 2, Tomb Raider) and the Intel IGP even has a slight advantage. The HD Graphics 5500, also in the Core i3, usually manages a big lead, both in 3D benchmarks as well as games.